On January 7, 1610 (402 years ago today! ), Galileo first identified three moons of Jupiter, the first satellites ever observed orbiting another planet. He later found a fourth, and today those moons — Io, Europa, Ganymede, and Callisto — are known as the Galilean moons in his honor. Galileo was able to do this because he used a telescope to observe: every new way to see reveals something new to be seen. You can buy a telescope that’s more or less equivalent to Galileo’s ‘scope here for a very low price. (It’s actually much better, in my opinion, since the housing is made of plastic instead of cardboard! Also, you don’t have to grind your own lenses.) I don’t endorse most products, but I’ll happily plug this one: it’s a non-profit group whose aim is to get people looking at the skies, and I’ve used these ‘scopes in my astronomy classes. What was a specialist’s tool in 1610 is something available for everyone today; you can even see the four Galilean moons of Jupiter with a decent pair of binoculars. I spent the holidays with my family in Iowa: my parents live in a very very very small town, without much light pollution. It was clear at night several days, and so we went out in the backyard to see what we could see. With my parents’ binoculars, we managed to see all four Galilean moons, and over three nights of viewing, saw how their positions changed as they orbit Jupiter. We were doing astronomy in the backyard: no specialized equipment, no special training, no observatory needed. Even in a city, you can still see the brighter planets (Jupiter is the third-brightest object in the night sky, after the Moon and Venus), and if your city is like mine, amateur astronomy groups are around that set up public nights to show you the sights. You don’t need to be a trained professional to be an astronomer. You don’t need a huge telescope. You just need to look up. You can learn to read the night sky, identify planets, look for interesting nebulae and stars. If the sky is clear tonight, you can go outside and see Jupiter after sundown, and if you have binoculars or a small telescope, all four Galilean moons will even be visible. 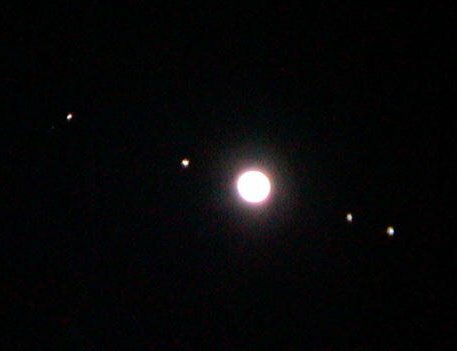 Jupiter is high above the horizon, and the brightest object other than the Moon tonight. Go look, and when you’re done, call yourself an astronomer. I’ll back you up.